Every year in the U.S., one-million unlucky people sustain whiplash. They get it in a split second. The occurrence of whiplash is even greater around the world. Normally, we can bend our neck only 45 degrees, front and back. But in a car accident, they bend and stretch their neck muscles and tendons almost 90 degrees, front and back. Some break their neck bones. Or even worse, they damage the spinal cord or pressurize it because the neck bones were moved by such tremendous force forward. At the time of the impact, they don’t feel the pain from stretched neck muscles and tendons. A few days or weeks later, depending on the impact and how bad it was, pure hell and intolerable pain are on the way. But for some it’s much worse after the impact. They simply can’t move their necks at all. They are the ones who really suffer with serious whiplash. Whiplash caused from a car accident can be one of the worst injuries people can suffer in the neck, upper back, lower back, and all the way down to their legs. Nobody is prepared for it. People are simply tired, other drivers don’t pay attention, somebody drives way too fast, or some ignore the red light. So in a split second there is a collision. It is always worse for the car who hits you from behind or from the side, but normally both drivers are in trouble including other passengers in the car. And it all depends on how fast he or she is driving at the time of accident. People can have minor accidents, more severe ones, or wrecks where they need immediate medical care. They are the ones in the worst situation. So when the accident happens, both drivers’ necks have gone 90 degrees, front and back in a blink of an eye. This is way too much stretching of the bones, the muscles, and the tendons from their normal positions. The power of the impact instantly pressurizes the discs in between the neck bones, and some people might end up having a slipped or damaged disc. Plus, all the neck nerves are taking solid pressure in a split of second. Sometimes, a person can snap a tendon in their neck or tear the neck muscle as well. The worst-case scenario is broken neck bones or damage to the spinal cord for life. It all depends on how physically strong the person is. The stronger the person is, the better off at impact they are. If the person is weak, especially the women, they are the ones who pay a huge price and have serious neck damage. If the neck bone is moved forward, it pressurizes the discs, nerves, and the spinal cord because of such impact by force. 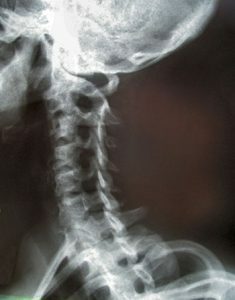 This is where the person immediately feels unable to move the neck at all. The neck is getting very stiff, tight, and locked. What happens to your neck three to four days or a week after the accident? Well, since you have stretched your muscles and tendons so much, they slowly but surely tighten up on you. This is why your entire neck starts getting compressed even more. As long as your neck disc can take the pressure, you are good to go and do not feel the pain. But when your discs are getting flat, and they are not able to hold your neck up any longer, this is where you start pinching and pressurizing your neck nerves to the limit. The discs in our neck are only somewhere close to a quarter of an inch or 3 to 5 mm in thickness, depending on how short or long of a neck you have. It doesn’t take a long time to compress them, especially when all the neck muscle gets stiff and the tendon gets tight. That’s the reason why the disc starts getting pressurized and getting seriously flattened. Now you can only pressurize the neck disc maximum 50%, after that you seriously start pinching the nerves. The moment you pinch the nerves in the neck, this is where your whole neck muscle and the tendon get even stiffer and tighter. Then immediately, our immune defense, the body water starts swelling up around the pinched nerves in between the neck bones and on top of the spinal cord. All of your muscles and tendons in your neck—front, back, and on both sides — are getting stiff and tight and locking all your movements. And at this moment you have way more pressure on your nerves. That’s the reason why the body water in between your neck bones is fully loaded and develops more pressure on top of your spinal cord. If the pressure on the neck disc stays there too long, this is where many people end up having a bulging, damaged, or slipped disc. Now you are in pain. And I mean serious pain. To be honest, anyone who is in this situation can go mentally insane in a short time. This is what serious whiplash does to everyone. You probably recognize all the following problems. You feel like your brain is shrinking and closing up on you, which slowly affects your balance. You are dizzy, have a headache, and run out of energy. Your eyes are dry and heavy because it’s also affecting your vision, and you may have difficulty seeing clearly. Your ears start making an annoying ringing sound, and it is getting louder and stronger. Your jaws are getting tight, and you have problems chewing food. You feel sometimes you can’t pronounce the words, which means affecting your speech. You start to have problems in your thyroid and have difficulty swallowing the food down. People start breathing more through their mouth instead of nose. And that’s why they start coughing a lot. This is exactly what happens when people have serious neck problems. Allow me to repeat the important information from Chapter 23 by again offering a crystal-clear explanation of what happens when you pinch the nerves from C1 to C7 in your neck and how they affect you. We have seven bones in our neck and the associated nerves. This is what happens when you pinch the nerves in your neck. When you pinch the nerve C1, you are in trouble with your balance, which also can lead to headaches. When you pinch the nerve C2, it affects your vision. You cannot see clearly, your vision gets blurry, and your eyes may get watery. For some people, the eyes get dry and itchy. When you pinch the nerve C3, it affects your nose for breathing and your ears may develop a very annoying ringing sound. No wonder why many people have nose, throat, and ear infection. When you pinch the nerve C4, it affects your jaw, teeth, and the tongue, and you may have a problem pronouncing words clearly. When you pinch the nerve C5, it affects your thyroid, which may cause people to lose control over their body weight. And because the organ is getting tight and locked, this may lead to thyroid cancer. When you pinch the nerve C6, it affects your food pipe. When you pinch the nerve, the food pipe slowly gets tighter, which sometimes makes it difficult to swallow food. When you pinch the nerve C7, it may affect the air pipe in your throat, which makes you cough more. It is a dry irritating cough. The nerves C5, 6, and 7 altogether control the movement of the inner arms all the way down to your fingers. When any of these nerves are pinched, you start feeling your fingers getting numb, tingling, and stiff. But the problem never stops there. It always travels further down. This is the body’s natural chain reaction, which we have no control at all. And that is the reason why the pain and the problems do not stop only in the neck. It goes further down to your upper back. Right now, you simply want to be left alone and the only thing you want to do is to lie in bed. The pain is simply too much for anyone who is in this horrible and painful situation. I guess you are doing the same thing like everybody else taking quite a lot of medication and running around from one treatment to another with very little results. Or even worse, using a cold ice pack to kill the pain for a short time. But the cold ice pack is not the right solution. Excerpt from DOC PETKOVSKI – THE TRUE STORY OF MY LIFE AND THE GIFT GOD GAVE ME THAT ENABLED ME TO CURE THOUSANDS OF PEOPLE WITH SPINAL CORD INJURIES, BACK PAIN, WHIPLASH AND ONE SHORT LEG.